The standard Vacuum Cleaner makes about 80 dB of noise, about the same as a garbage disposal, dishwasher or freight train. Hearing damage can be caused at this dB if it is sustained for eight hours or more. While one would hope your cleaning routine doesn’t include eight hours of vacuuming I think most of us would agree that noise at this level is very disruptive to daily life. If “quiet” is on your list of must-haves for your new vacuum cleaner, read on to find out which features will help you find the best option to fit your budget without sacrificing functionality. 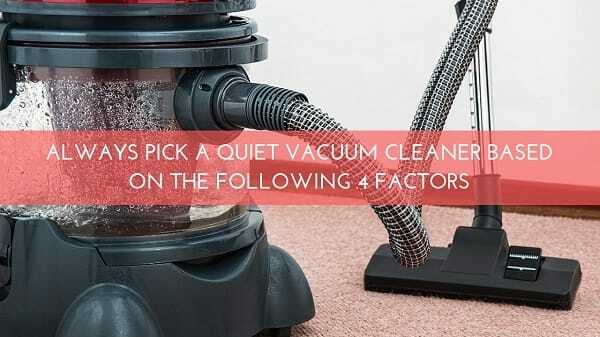 The type of vacuum cleaner can actually determine its noise level. While robotic cleaners are touted as the quietest among all vacuum cleaners, their recommended use is as a secondary cleaner to a more powerful upright or canister vacuum cleaner. Upright models have larger motors, are heavier, and have motorized brushes that create noise in addition to the motor. Additionally, the location of the motor higher up in the machine means the noise more easily spreads throughout the room. A canister vacuum cleaner on the other hand runs with a smaller motor that sits lower to the ground which helps muffle the sound and prevents it from spreading. They also happen to be significantly lighter in weight than the upright vacuums. Another factor to consider when searching for a quiet vacuum cleaner is whether or not a bag is required to collect the dirt. While bag less options can seem like a cleaner, environmentally friendly and economical option, the bag actually helps contain the sound of the debris being collected in the vacuum. The bags are also good at helping contain dust particles when being replaced and generally help keep the air clean while the machine is in use because the bag often acts as a second filter. So, they offer not only noise filtration but air filtration as well. Dyson is frequently listed as one of the best quiet vacuum cleaners on the market. To greatly reduce noise Dyson first created a bladeless motor, which eliminated one area of noise pollution as debris flows through the motor. Then they controlled the air flow through the rest of the hard-interior surfaces. Fast Company interviewed one of Dyson’s engineers, John Baptiste, who explained the principle of the Helmholtz cavity in which “sounds gets reflected through hard, curved surfaces. The phenomenon explains why holding a seashell to your ear will produce a breathy, whirring sound… Noise is created… but more importantly, noise can be meticulously controlled.” Dyson used this principle to help control the air flow by adding a cavity that traps the air and contains the noise rather than allowing it to bounce around in the base of the vacuum cleaner. If a bladeless motor and controlled air flow aren’t in your budget, then consider looking at a vacuum with a lower powered motor (Watts) and better suction (Air Watts or AW). A high-powered motor will always create a lot of noise, but you can get good suction without a large motor. Air filters are cleaned regularly. A dirty air filter will create more noise because the machine will need to work harder to create suction. Clogs aren’t building up anywhere. A button or pocket change clanging around inside the machine certainly add noise, and as with a dirty air filter, dust, debris, and hair clogs can also require the machine to work harder. Look for a vacuum cleaner that is easy to take apart and put together because regular inspection and cleaning are necessary in any model to help keep the noise down. Many consumers are concerned that a quieter vacuum cleaner will never clean as well as a loud one. As you can see from the above features, suction is not tied to noise levels. A quieter vacuum will get your Home Maintenance with most of the quieter models reducing noise levels to between 65 and 70 dB and ranging in price from $35 to $400.